Don’t worry, we get it – coming up with new and amazing #GivingTuesday campaigns every year can be exhausting. With one of the largest charitable giving days of the year occurring right near the end of the year-end giving season, it can be hard to generate ‘creative energy’ to stand out from the crowd. While it’s difficult to wade through the year-end fundraising noise to broadcast your charity’s #GivingTuesday campaign, don’t push it aside – #GivingTuesday is a big deal in the nonprofit world for a good reason. 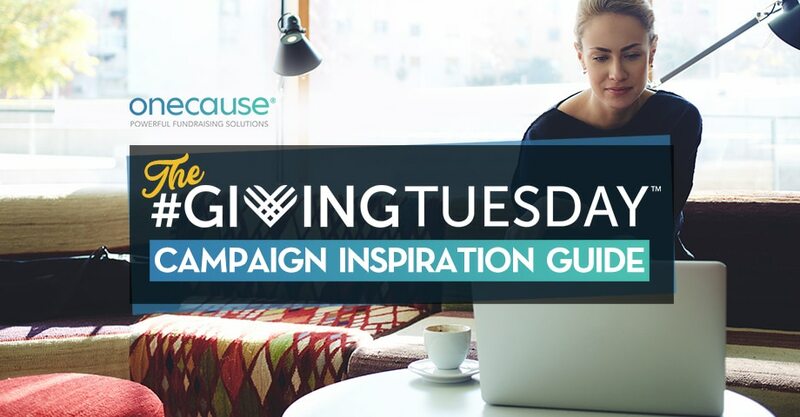 To give your nonprofit an edge, we’ve put together this campaign inspiration guide to get the creative juices flowing and to kick-start your team’s #GivingTuesday planning. After all, it’s always better to start early with #GivingTuesday planning, and there’s no time like the present! #GivingTuesday success all comes down to messaging. Make it easy for your donors to understand what your campaign goals are, how they can get involved, how they should donate, and most importantly, why their donation matters. Create specific online microsites or giving pages to eliminate confusion about your campaigns and make sure these sites are mobile-friendly. Work with easy-to-use fundraising platforms to give your donors the opportunity to text-to-donate, making giving on the go during #GivingTuesday even easier. Social media is a nonprofit’s secret weapon. During #GivingTuesday, leverage social to its fullest by enabling your donors to appeal to their networks and followers. Create peer-to-peer fundraising campaigns to give all of your constituents the power and flexibility to engage with new donors and increase the potential of raising more money for your cause. Since #GivingTuesday rounds out a wild weekend of shopping and holiday festivities, keep your organization top-of-mind with well-curated partnerships. Partner with retailers that would be willing to donate a portion of their proceeds over the holiday weekend to your charity and share your message with all of their customers. #GivingTuesday is about raising awareness and getting in front of new audiences, and partnerships are a great way to move forward. If social media is the new secret weapon, then it’s critical that your nonprofit stands out in the crowded social environment. Consider creating a unique campaign theme or a #hashtag to measure the impact of the campaign and allow donors to tag the campaign in social posts, giving you even more visibility. Here are five #GivingTuesday campaign ideas to boost your creativity and help get you started. Don’t wait for October to come around to start with your end-of-year giving strategies. The trick with any #GivingTuesday campaign is to get started early and stick with your campaign. Sometimes, all it takes to move a good idea into a great one is to add an element of competition. Create leaderboards on your website and update your donor contacts with information about how your campaign is going and celebrate those who participate with raffles, giveaways, and prizes. With a bit of competition involved, donors can be personally engaged and involved in reaching your donation goals. When it comes to interactive content, numbers speak for themselves – fundraising campaigns can raise up to 150% more with a personal video than those without. Start your #GivingTuesday campaign with a video showcasing a personal story behind your charity. Sharing messages in an interactive way can give your campaign a boost emotionally and financially. As we mentioned before, social media is the king of #GivingTuesday success. Think about viral giving campaigns like the #IceBucketChallenge and use this as a jumping off point. Create a catchy #hashtag and message that appeals to new groups of donors, especially Millennials. Grow your social base well before #GivingTuesday comes around for maximum impact and viral potential. It still pays off to keep certain aspects traditional. When it comes to engaging your nonprofit’s previous donors, nothing beats simple email marketing campaigns. Just make sure you refer to your #GivingTuesday campaign in your emails to keep your messaging consistent. Another tried and true way engage past donors is direct mail. Sending out letters or postcards with a link to your microsite, text-to-give details, and even your social #hashtag can bring donors online for your cause. While #GivingTuesday happens the weekend after Thanksgiving (and after the whirlwind shopping holiday) it’s more than just an end-of-year campaign. Celebrate #GivingTuesday year-round with campaigns that aren’t holiday specific and that serve to keep your nonprofit’s cause top-of-mind. No matter how you chose to celebrate #GivingTuesday, make sure you have the right resources and solutions in your corner to help achieve your goals.